Gorgeous statue, right? So detailed and pristine. It’s amazing that there’s such incredible art work brought in to the Alabama Renaissance Faire, which was this past weekend in my town of Florence, at Wilson Park in the heart of downtown. In fact, this statue is so breathtaking that it’s worth two different photos. But … wait … Notice anything? It’s like those “Find the Differences” games when you’re supposed to compare two almost-identical pictures. Because you’re right if you think the statue has moved — because, of course, this is not really a statue. It’s Barbara O’Bryan, of Ypsilanti, Mich., who portrays the living statue Naimh A’Danu — a huge crowd-pleaser at the Alabama Ren Faire. I have no idea what all she has to do and how long it takes to transform herself into a statue, but I do know that everybody who wanders by is fascinated. O’Bryan’s grace and patience are phenomenal. Didn’t we play some sort of statue game when we were kids? Maybe that’s how she got her start. 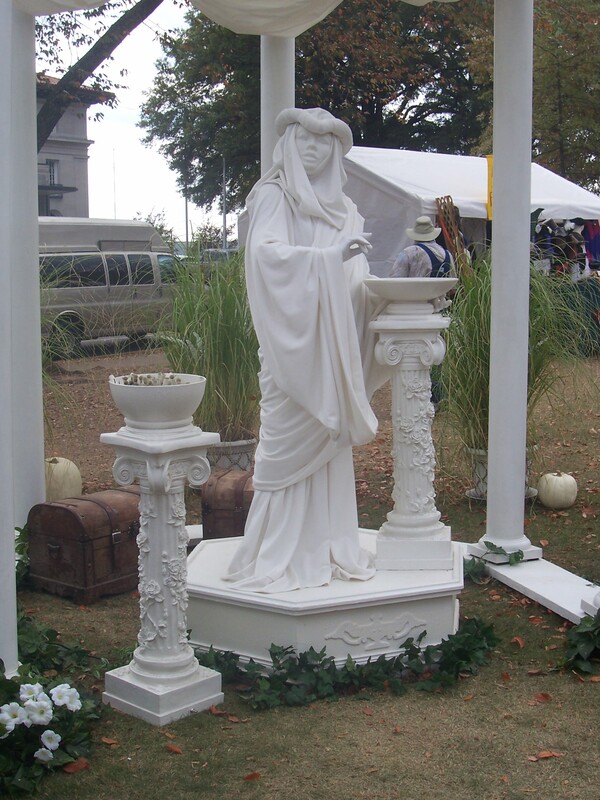 This entry was posted in Alabama, art, family, Florence and tagged Alabama Renaissance Faire, art, Florence, Living History, living statue, Renaissance fair, Renaissance Faires, tourism, travel by Coffee with Cathy. Bookmark the permalink. Amazing. Is she wearing a mask? I cannot figure out how they could have done the eyes otherwise. Very interesting. Carolyn — You are so right that she seems to be wearing some sort of mask. I hadn’t thought of that until you mentioned it. I’m telling you, it is so incredibly startling to walk by and then realize exactly what you’re seeing. Amazing! Faire is only two weeks away. I’m looking forward to being there for the silver annivesary. And seeing Naimh A’Danu, Torok the troll and other faire regulars.